Your search for a men's February birth stone ring you take you to a ring with an amethyst gemstone. This is one gem that has remained in the limelight for many centuries. You will find mention of amethysts in the Bible, in the birthstone charts and even in the gem and jewelry lists related to anniversary gems. In ancient times, people encouraged the drinking of wine (alcohol) from mugs carved from amethyst. The belief was that, this would save the drinker from intoxication! In fact, the very word 'amethyst' is derived from a Greek word that literally means 'not drunk'. 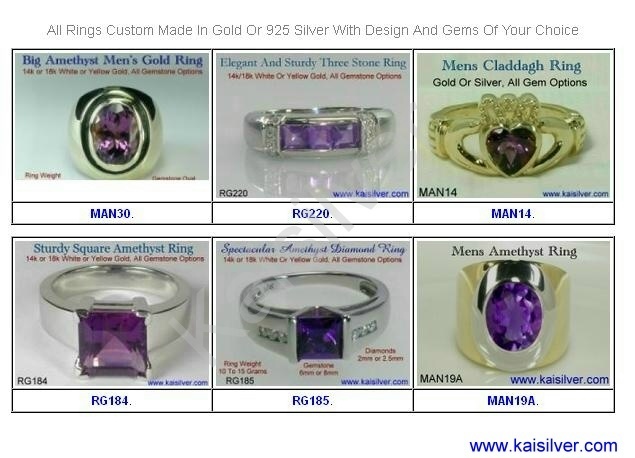 When choosing a men's amethyst ring, make sure that the gem color is something that will satisfy you. In general we would say that, a very pale (light) purple amethyst should be a 'no no' for men's jewellery. Light amethyst is so very pale that you will see more finger skin color rather than gem color through the gem when, the ring is worn. A very dark purple amethyst satisfy you if you are looking for an amethyst rings that has a great stone but, not much lustre and glitter. On the other hand if you wish to wear a men's February birthstone ring with an amethyst that shows it's color and flash perfectly. go for a medium color amethyst gem. Most men prefer to wear gem rings that have high carat size gems, something that is often not possible with many gems. For example, a mens sapphire ring with a 5 carat gem would substantially strain your wallet even if, you settled for a medium grade sapphire gem. Fortunately, gem size will not be a issue for most budgets when, it comes to a men's amethyst ring. Good amethyst is not cheap, but given it durability and impressive look - the gem is reasonably priced even in gem sizes that are as high as 5 to 7 carats.